Attock (PR). 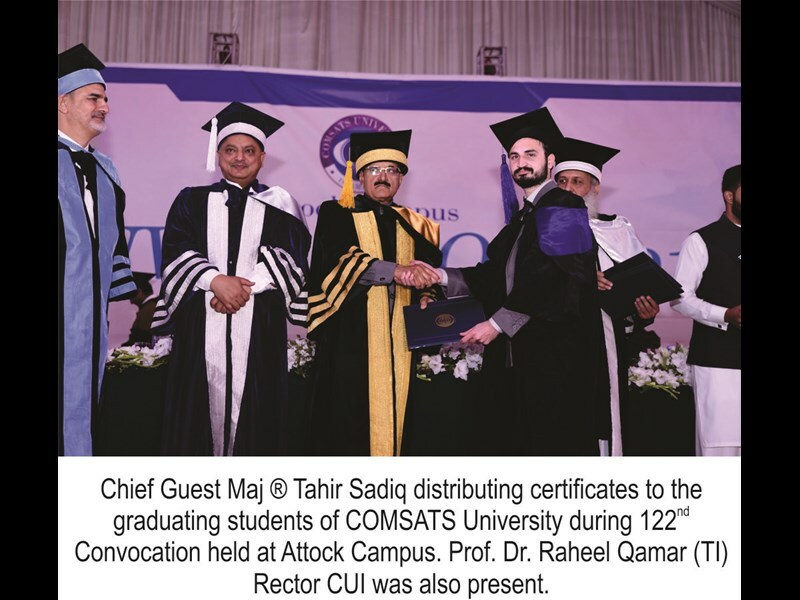 Member National Assembly Maj(R) Tahir Sadiq was the Chief Guest at the 122nd Convocation of COMSATS University Islamabad (CUI), Attock Campus held on Friday the 29th March. A total of 742 graduating students were awarded degrees belonging to the departments of Management Sciences, Electrical engineering, Computer Science and Mathematics. Rector CUI, Dr Raheel Qamar (Sitara-e-Imtiaz), Directors of other campuses of CUI, Academic Council Members, Ex-Directors of CUI, Attock Campus, officers from the District Administration and Pakistan Aeronautical Complex Kamra, Heads of Educational institutes, Media Persons, Representatives of Regional Banks and Industry, Faculty, Parents and Students were also present on the occasion. Addressing the convocation, the Chief Guest, Maj(R) Tahir said that the way CUI, Attock has contributed to educational uplift in the area since its establishment. The spirit and the untiring efforts of the institution are praiseworthy. He recalled the days when the region was deprived of any worthwhile higher educational institute. With the inception of CUI, Attock a hope was developed for better education at minimum financial load. He also said that now he can see the being hope fulfilled. He mentioned that how bigger the CUI, Attock has grown with more qualified faculty and infrastructure. The impressive new Campus of CUI, Attock is a testament to the commitment of CUI, Attock Campus to ensure the highest standard of excellence without any compromise. The Director CUI, Attock campus, Air commodore(r), Dr. Abdul Rehman presented the campus report and informed that since its foundation in April 2004, COMSATS is providing quality education, and is contributing for the development in the country. The ceremony culminated with the degree and medal distribution among the graduating students.